"I've had some pretty good success in MLM. I was one of the top distributors with one company. But apparently I wasn't doing a very good job of teaching, because few people who joined me could duplicate my success. "Eventually, I stumbled across Michael Dlouhy and his mentoring and coaching approach to building people. As a 'Green', (learn more about that from the "Colors" training), I was skeptical about EVERYTHING Michael said and did. But as I tuned in to various conference calls and coaching sessions he'd host, I was amazed at his patience and consistency. Michael is the real deal." Wisconsin - I've been lucky most of my life to have had above average success at most things. But after a few years of network marketing, I was frustrated that my success was not being duplicated by others I introduced to the business. I began to doubt my choice. After 4 years in the Air Force in the early 1970's, I've been self employed most of my life. 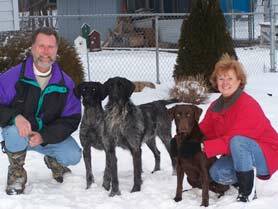 I've been a professional dog trainer and hunting guide, dabbled briefly in the real estate industry, and had a succesful insurance and financial planning business ... which taught me the power of residual income. Although I liked real estate, my wife and children didn't appreciate my 70-80 hr, 7 day-a-week work schedule. Eventually I realized that even though I was "successful", I still woke up unemployed every morning. Our income totally depended on me getting out every day and selling. By the way ... before real estate, I would never have thought of myself as a "sales type". I was shy, not comfortable in crowds or talking with strangers. Like Most People In The World ... I HATE To Be Sold! Years ago, a move back to Wisconsin from Washington state had us looking for a home. We ran into some "bad apple" real estate agents. They made it obvious their only interest was selling us a home to earn a commission. So I thought to myself, "Boy, if these obviously self-interested jerks can make a living doing this ... what would happen if I took a sincere interest in HELPING OTHER PEOPLE find whatever THEY were looking for? I'll bet I could do really well!" They Looked At Me Like I Had Three Eyes! They laughed. They didn't see me as any kind of salesman. They thought I had NO CHANCE for success. That was all the extra motivation I needed. The thought of them laughing at me kept me going during the tough times. I'd do anything to put off picking up the phone to make a "cold call" or knocking on the door of a home for sale "by owner". And in the beginning, both literally made my palms sweat. I got past those difficult times and started having some success by focusing on HELPING OTHER PEOPLE. But the long hours were taking a toll on my wife and small children. So I started looking again. I ran across a blind ad in our hometown paper that seemed right up my alley. They wanted someone with a sports or teaching background and a strong desire to succeed. I was disappointed when I showed up for the interview to find out it was about selling insurance. I didn't (and still don't) consider myself a "sales type". But the person I interviewed with, who would be my manager, was a down-to-earth former high school physics teacher. And again I thought to myself, "Well he doesn't seem like the typical 'sales type' either. And if he's having so much success, MAYBE I can too." And the move put us back closer to old friends and our families. So we gave it a shot. I worked hard for a couple years for one company, then went "independent" to do a better job for my clients. Unfortunately the long hours were tough on my marriage. My wife picked up and left, leaving me as a single parent with two small children. That day, parenting became my toughest but most rewarding job ever. And it gave me a completely different perspective and total respect for all good mothers and single parents everywhere. But building a new business while I was raising 2 kids was quite a juggling act. Our System Is SERIOUSLY Screwed-Up! We go to school for years to get an education to qualify us for a job. Then we slave 30-40 years to get to retirement. Great. Except we're often too old or in too poor health to do the things we'd really LOVE to do. And many people can't afford to do the things they'd REALLY like to do. Wouldn't it be better to do the things we LOVE, while we're still healthy and capable of doing them? Fortunately for me, the RESIDUAL INCOME I had coming from my employee benefits and business accounts gave me an option. So in 1984, at the ripe old age of 34, I went into "semi-retirement". Ten years later I married my current lovely wife. Marcie had a regular job, and wasn't quite sure she liked all the free time I seemed to have. And I didn't think I was making enough for BOTH of us to be "retired." So in 1997 I decided it was time to either revive my semi-dormant retirement & financial planning business or look for other options. Now to find the right company. I put together a system to analyze all the options. From this, I found a good company that's still in business today. But good coaching and training from my upline was missing. So I struggled for 18 months. I didn't make any money. In fact, I spent a lot. But I did learn some important lessons. So I decided to apply them with a "better" opportunity. Within a short time I was having pretty good success with the next young company I joined. But apparently I wasn't doing a very good job of teaching what I had learned, because very few people who joined me ever duplicated my success. Eventually the company dramatically changed the compensation plan and my commission checks got slashed. I've tried a couple other companies in the meantime and had some moderate success. But the duplication and the retention were not there for the long term success and FREEDOM I was looking for. Eventually I stumbled across Michael Dlouhy and his mentoring & coaching approach to building people. As a "Green", (learn more about that from the Colors Training) I was skeptical about EVERYTHING Michael said and did. But as I tuned in to various conference calls & coaching sessions, I was amazed at his patience and consistency. Here's A Guy Who's The Real Deal! Michael is sincerely interested in HELPING OTHERS. He often talks about "getting things from your head to your heart". And until you do, those words don't mean much. But eventually the "lightbulb clicked". And I realized I've come full circle. My success in previous careers earlier in my life was NOT because I was the greatest salesman on the planet. I never was, never want to be, and never will be. But I focused on HELPING OTHERS. That's exactly what Michael and members of his Success Team do. And when you get that from your head to your heart, magical things start happening in your business and life. I still have a lot to learn and a long way to go on my path to personal development and TRUE SUCCESS. But it's great to have a mentor and support TEAM so willing and eager to help. I've been around network marketing for several years, and have had the privilege to personally meet and work with some of the icons in the industry. But I've never experienced anything remotely close to what this TEAM has going. Plug into our free generic training. You'll love the RESULTS. I strongly believe we can HELP YOU have more success. And thanks for taking the time to read my story.